ClassPass it running a great “come back to us” promotion if you were a member in the past. 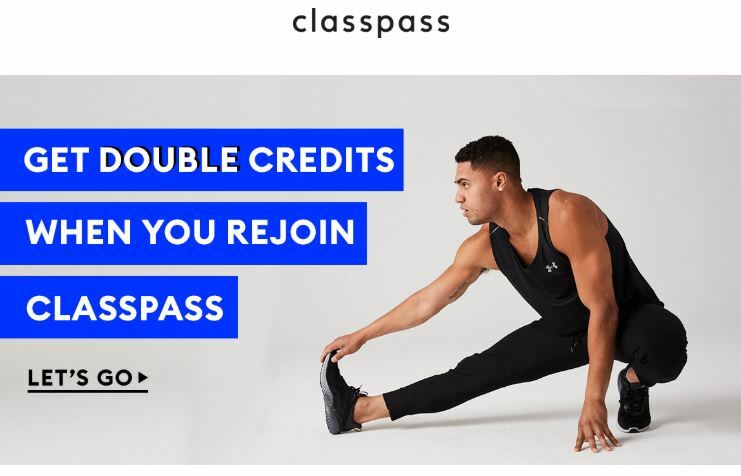 You probably received an email boasting: “Get *double* the credits” that if you return to ClassPass, they’ll do exactly that. We’ve made some updates to our membership and we’d like to invite you to try us out again by giving you double the credits your first month back. Experience more variety, discover more workouts, and even get up to 10 unused credits rolled over each month! This is a great promotion if you’re someone that wants to get the late-summer body because double the credits for their top-tier plan is 200 credits which means you’ll have to take approximately 20 classes in the next 30 days. Totally doable if you’re motivated. To be eligible, you must have received this email directly. The promo can’t be stacked with any other offer. To redeem, the addressee must click on their promotional email link, and complete purchase before Friday, July 27, 2018 at 11:59pm PT.